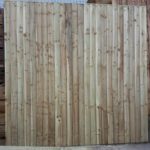 All the feather edge fence panels featured on this page are available from stock with delivery in 2-5 working days. These panels are constructed using 47mm x 32mm horizontal rails, 18 number feather edge boards and a beveled capping rail. All components are fully tanalised prior to construction. Fully framed and tanalised (Pressure Treated). for durability. Available from 2ft through to 6ft high. Fully framed and tanalised (Pressure Treated). Available in various heights – 2ft through to 6ft. This is the most robust of our range of panels. The panels benefit from the use of heavy duty framework 47×32 cross rails and 32×32 side battens. There are 24 x 100mm(4inch) boards per panel. These panels are on a made to order basis and require an additional 3-5 working days to supply. All nails used are stainless steel. The panel is fully framed and comes complete with the capping strip. All componants are Tanalised (preasure treated) before construction. Constructed from quality tanalised (Pressure Treated). boards for durability. Our panels are a robust alternative to an overlap or larch lap variant. 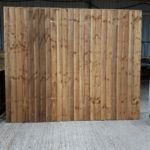 Slightly more expensive due to the thickness of the timbers used in it’s construction and the quantity of wood used in these fence panels, these panels come in industry standard widths of 6 ft so you are likely to be able to use them as replacements for existing or on new fence runs. You can identify a featherboard panel by it’s vertical boards. Overlap or larch lap boards are horizontal. 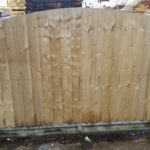 Feather edge fence panels are ideal for boundaries where you want to maintain some privacy and security. 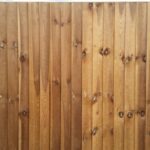 You can slot them between concrete posts , nail them to the face of timber posts, nail them between wooden posts or attach them to timber using fence panel clips to create a garden boundary or fence off other areas. You can use them in conjunction with concrete gravel boards to keep the bottom edge of the timber off the ground and prevent rot and can add trellis to the top to create extra decoration and height. 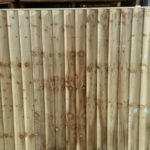 If you are planning to use trellis make sure your fence posts have enough length so you can pin the trellis to the posts. Available in industry standard six foot widths. We supply a variety of heights to suit most applications. In our tanalised range we supply 2, 3, 4, 5 and 6 ft high panels. We stock all sizes and options year round. Be careful when choosing the height you want to allow for any trellis or gravel boards that you might want. So if you want a 1 ft concrete gravel board and a piece of trellis at the top and want a 6 ft high fence you will need a 4 ft panel and posts that are at least 8 ft in total length (2 ft will be buried). Constructed with five inch featheredge boards for strength and rigidity. Choice of colours – either brown or green. Tanalised treatment – tanalised means no preservative required. Fully framed and capped for strength. Three to four mid-rails dependent on height option chosen – improves rigidity. Pinned with galvanised nails to prevent corrosion. Can I Install This Fence By Myself? Feather edge fence panels are heavier than cheaper alternatives and because of the width can be awkward to handle. As a result you may find you need two pairs of hands to fit these panels between existing slotted concrete posts. Be careful if the panels are damp. The weight your handling can rise to 37kgs per panel with the dampness of the timber. Created From Timber Sourced From Renewable Sources. All our feather edge fence panels and made on site. 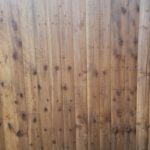 The timber used to create this fencing comes from reputable sawmills. All the timber supplied to us from these sawmills for the production of these panels carries the FSC mark. The FSC mark is a global certification scheme which confirms the timber has been sourced from well managed forests which are operated on a renewable basis. You can be confident that your panels are not produced from timber that has caused environmental and habitat destruction but are the product of forests that are harvested and planted continuously in a renewable fashion for the use of future generations. We deliver right across the UK. If you are in Coventry, Birmingham, Leicester, or Northampton or the surrounding areas we can usually get a delivery of feather board panels out to you within a few days. From time to time we can offer next day delivery but be sure to call and check availability and delivery times before placing your order.